Kelly Page (@drkellypage , see: http://caseinsights.com/) spent some time telling us about the wiki based learning activities she’s been doing with students to promote collaborative working. This naturally dovetailed with a topic that is of interest to Mike Johnson (@agentjohnson – see: http://networkedlearning.blogspot.com/). He’s in the early stages of investigating ways of automating peer generated feedback in online collaborative tasks. It’s early days, but there’s something very appealing about this approach – take a look at his CEQ related post. There was also a fair bit of chit chat about ‘digital literacy’ and what it means for different people (for starters read ‘Thriving in the 21st century: Learning literacies for the digital age’). Do staff and students in different subject areas and disciplines understand it in the same way? In what way is different or the same as ‘Information Literacy’ or ‘Media Literacy’? (see: New media and literacies: Amateurs vs. professionals) – and most importantly, how can we go about improving the embedding of such knowledge and skills in courses and curricular across the University. I for one, would really enjoy revisiting this topic, in particular with regard to the Employability agenda being pushed by WAG. Sara Nicholas (@sarahnicholas) described the work she’s been doing with fellow librarian Susan Smith on the design and development of a forthcoming workshop entitled ‘The Connected Researcher’, which is all about enabling researchers to engage through social media and technologies to establish better networking and collaboration. Some of the more intriguing things discussed were the notions of ‘digital identity’ and ‘digital footprint’ and the how and why a researcher might want to take greater control over these. There was the usual exchange of what’s new on the iPhone and iPad . For me personally, Dropbox‘s traction continues to grow with clever interfacing to applications across all platforms. A good example of this is Trunk Notes. A fairly simple and straightforward personal wiki that automatically stores its content in plain text on Dropbox. Very useful because allows adding and editing content regardless of where I am. I’m deciding whether to move all my notes into this wiki. I’ve been a long time fan of concept mapping and I’m desperate to see a good tool developed for the iPad. IThere are signs of steps being made towards that with applications like Popplet. I can’t say it’s won me over yet, but I need to give it some more time and test out it’s export/import capability with more thoroughbred tools like Cmap. The next ThoughtGrazing Social Media Cafe is scheduled for 1-4pm Wednesday 12th January in the usual place – the lounge of the Posgraduate Centre above the Students Union on Plas-y-Parc. All welcome, join us for a coffee and chat about anything to do with social and technology and media. A lot of the conversation at todays “cafe” was centred around wikis. Rachel from the Grad Centre attended for a while and we hopefully gave her some ideas as to why and how it might be a good idea to investigate using a wiki as the repository for their operational procedures. She’s looking to rewrite them all and it would appear a good project for collaborative authoring. 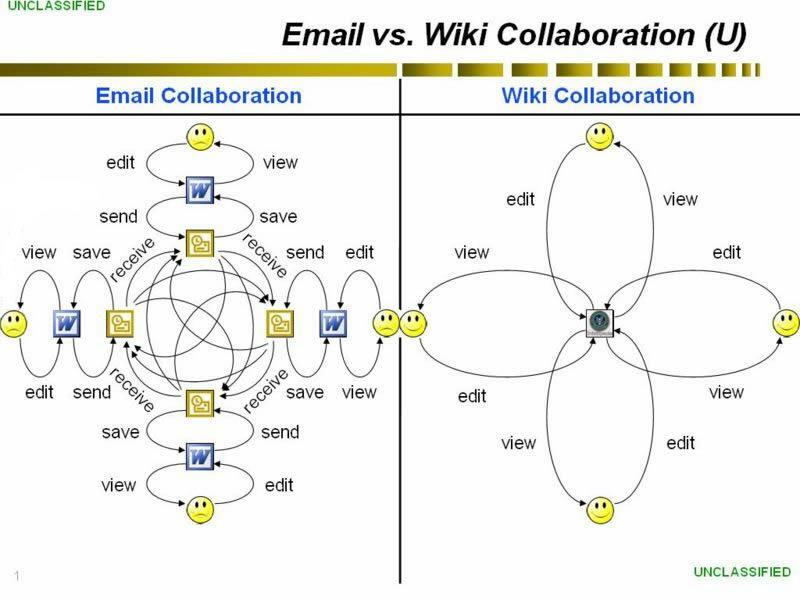 … I think as a diagram it so graphically shows why email is NOT a collaboration tool (as if any of us ever did); but the post quite thoughtfully suggests that the problem in getting wikis established in the enterprise might more be to do with the perception that a wiki is a website (with all that carries with it in terms of governance). If it could be positioned as a service that augments an email system it might appeal more to corporates because that would place it nearer their comfort zone. Of course as many at the “cafe” said, the diagram to the left is a simplification of reality, and if you add cc’d and even bcc’d users, and users the document might be forwarded to, then the possibility of a cohesive and meanigful collaboration is distant indeed. Anyway, it caused some mirth, some consideration and hopefully provided some assistance for Rachel. Prior to that we’d been discussing software that allowed collaborative authoring in meetings, or learning sessions. Joe Nicholls had been experimenting with sync.in whilst Mike Johnson had been doing likewise with typewith.me. They appear to be identical and appear to be a product of Google wave activity. Worth a look and full revision history is provided through URLs. Mike was also keen to talk about dialogue; how you engage with students, encourage them to participate and he spoke to me about a number of themes which I’d be hugely grateful if he’d expand as a comment to this post … please Mike! He also introduced discussion on motivation and reward for encouraging participation in group activity. He’d considered chocolate; he’d heard about virtual stars added to avatars; what can you do to recognise “good behaviour”? The next issue was how you handle the disappearance of an externally hosted service (such as drop.io) that you might have “recommended” to staff or students. Can you wash your hands once you’ve given an introductory task – hopefully making them aware of what they should be doing at the same time as using the service to protect their information, or do you have a responsibility to be pro-active once you’ve given some advice. We didn’t achieve consensus on that one but agreed that education and training was vital – new literacies indeed; and that we did have a responsibility to alert when we became aware of a failed service – beyond that some disagreement. Should we indeed be pro-active at all, offering to find solutions and alternatives, for instance? Finally, there was some discussion on the emergence of open source as a more plausible alternative to commercial offerings. Yes, we do use a lot of open source, but mainly in the back office and not visible to users. Would we want to replace our VLE software, or our collaboration suite with open source offerings? What would the issues be in moving in that direction? What is the support model that would be required? We ran out of time and agreed that it would be a good topic for a chat at a later “event”.